Art of the Rifle blog	Automatic Rifles: Should the M249 be replaced? The notion of an “anti-gun media” is crap! It is a lame excuse to explain why shooting fails to make mainstream media and, sometimes, as a boogeyman to scare people into giving money to political and lobby group fundraisers. Garnering publicity and earning media coverage is a long row to hoe for every organization. Outside your circle of colleagues and friends, nobody cares. Trying to convince an editor or publisher in print, broadcast or online media requires hosting an on-going series of regular, interesting events and continuous promotion. It is a process of years with no guarantee of success. No gun or hunting organization today is doing this effectively which is a large reason why pro gun publicity is so sparse. Rotary District 5840 (http://www.rotary5840.org/) held a fundraiser billed as the “Million Dollar Dinner.” They exceeded their goal and raised $1,070,000 for the Rotary Foundation Permanent Fund, which is used for literacy programs and Polio eradication. 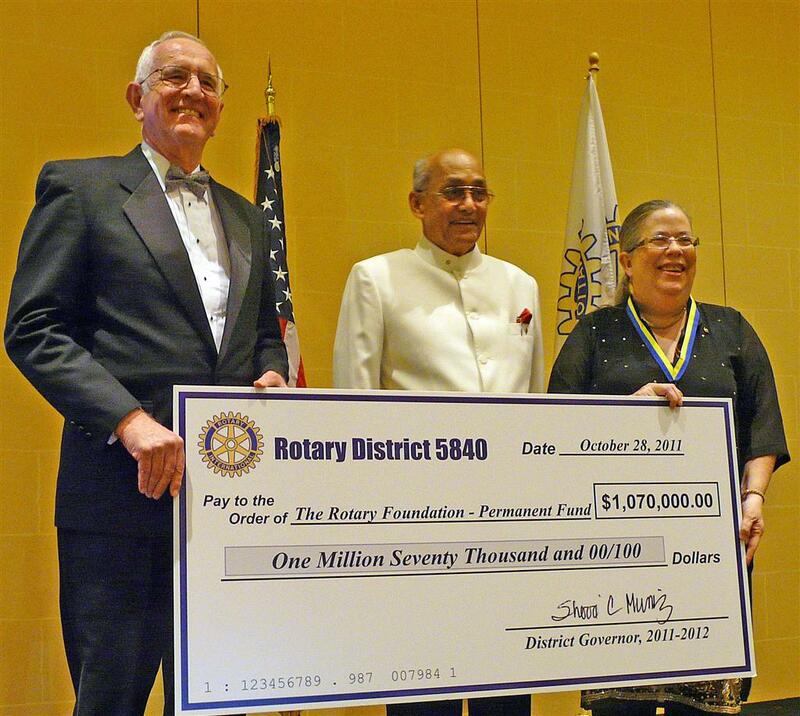 Pictured below is Chairman of the District Rotary Foundation Committee Doug Whinnery (left) and 5840 District Governor Sherri Muniz (right) presenting $1.07 Million to Rotary International President Kalyan Banerjee (center) at the District’s Million Dollar Dinner on October 28 in San Antonio. The money raised goes to the Permanent Fund of the Rotary Foundation, ensuring the work of the Foundation can continue in the future. They raised and gave away over $1 million and couldn’t land a story. When was the last time your shooting club gave away a million bucks? Other than Wayne LaPierre’s annual salary, when was the last time the NRA donated a million dollars? So, following the rhetoric of pro gun lobby groups, the media must also be “anti-Rotary” and “anti-charity.” Or, maybe, publicity is not a promise. It is a long, imperfect effort fraught with difficulties. No single event can be expected to catch everyone’s attention. Good point. Human nature seems to prefer negative drama over human interest. I have seen a few gun blogs commenting on where gun control lists for public priorities. The reality is probably more that people are more interested in their twitter, facebook, and pinterest events than what is going on with American civil liberties (2A in particular). The long term result will likely stem from who has the most dedicated followers voting and advocating for their side.